I recently sent a few old machines off for recycling. Both had relevance to the early days of the FATE testing effort. As is my custom, I photographed them (poorly, of course). 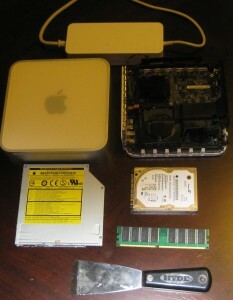 First, there’s the PowerPC-based Mac Mini I procured thanks to a Craigslist ad in late 2006. I had plans to develop automated FFmpeg building and testing and was already looking ahead toward testing multiple CPU architectures. Again, this was 2006 and PowerPC wasn’t completely on the outs yet– although Apple’s MacTel transition was in full swing, the entire new generation of video game consoles was based on PowerPC. I remember trying to find a Mac Mini PPC on Craigslist. Many were to be found, but all asked more than the price of even a new Mac Mini Intel, always because the seller was leaving all of last year’s applications and perhaps including a monitor, neither of which I needed. Fortunately, I found this bare Mac Mini. Also fortunate was the fact that it was far easier to install Linux on it than the first PowerPC machine I owned. After FATE operation transitioned away from me, I still kept the machine in service as an edge server and automated backup machine. That is, until the hard drive failed on reboot one day. Thus, when it was finally time to recycle the computer, I felt it necessary to disassemble the machine and remove the hard drive for possible salvage and then for destruction.